It should be completely opaque for reflectance measurements or completely transparent for transmission measurements. Translucent samples have their own set of needs where sample thickness and backing are very important and need to be clearly specified and controlled. Any sample that exhibits directionality should be rotated 90° and averaged for at least 4 readings. When selecting material to establish a master standard, enough material should be set aside to make numerous specimens. You’ll want to have a few standards that you keep in reserve. When creating an electronic color standard, each master standard should be screened to make sure that it represents the standard to within a very tight tolerance. The way to do this is to select a number of plaques or specimens to be considered. Let’s say 20 or double the amount that you need. Measure all specimens and then calculate an electronic average of these 20 (or whatever number you need). Use this average and then compare all of the specimens to the average and select those that are within a very tight tolerance (e.g. DE=0.10) to be considered as master standards. Any specimens that fall outside of this range should be discarded as not suitable. In OnColor this is easy to do. After measuring all of the specimens as Trials, use the Option under Standard-->Average Trials to compute a new electronic standard that is an average of all of the trials. OnColor then instantly makes this calculated average data the new Standard and all Trials are compared to this new derived standard. Discard any specimens that are greater than DE=0.10 away from this average. 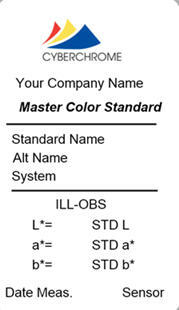 Any specimens that qualify as master standards should be labeled as such including the name, date and time of measurement and the L*a*b* data and deviation from the electronic standard. All master standards should be protected from unnecessary exposure to light, heat, and humidity. Typically they may be stored in a freezer packaged in an individual envelope to minimize degradation due to aging. Using Pantone standards of ink on paper does not make a good color standard unless you are printing inks on paper and using the same materials as Pantone. For all other industries, it is much better to follow the third guideline above and use a standard that is made of the materials found in the end product. The most successful color management programs pay close attention to developing and maintaining the color standard. How do you manage your physical color standards?